Idea and performance: Simple brass lines cut back and forth across the floor of the atrium like a mapping system. 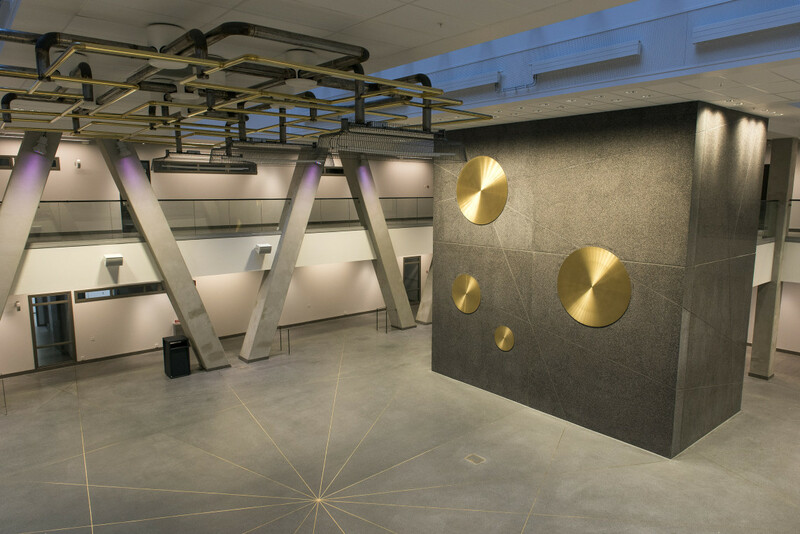 The lines transfers into relief on the concrete wall and take the shape of huge polished brass cylinders. The artwork reflects light and changes depending on where you are located in the room. Idea and performance: In the roof of the atrium at the University Hospital David Taylor has placed a complex installation consisting of copper, aluminium and steel. The winding structure provides the framework for a lighting design that gets the visitors to turn their gaze upwards.